Roegelein Ingenieure have long-time planning experience regarding industrial engineering facilities for energy conversion, e.g. heat stations using combined heat and power (CHP) or combined heat, cooling and power trigeneration (CHCP). Our planning concepts are derived on the basis of the best possible CO2 efficiency. Temperature- and pressure levels are defined according to the designated application regarding cost and system efficiency. The concepts for energy conversion and consumption adapt the market's most important energy sources like natural gas, light fuel oil, biomass energy and heat from waste incineration. Roegelein Ingenieure have planning experience concerning district heat supply of municipal/residential areas, inner-city regions and industrial areas with the energy source of waste incineration heat. Since waste incineration facilities are equipped with flue gas cleaning, the supply areas are being provided with heat without emissions. Heat extraction from the waste incineration facility is usually being realized by extraction of steam from combined heat and power processes and to some extent by including heat from the combustion furnance's grate cooling (Rostkuehlung). 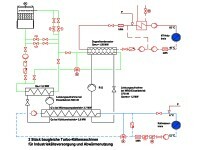 Roegelein Ingenieure refer to some huger facilities in the field of industrial heat and power cogeneration listed at selected industrial engineering projects. These concepts were developed in combination with thermally powered cold water generators for district cooling supply and for generation of process steam. Thermally powered cooling generators are usually being implemented to satisfy the base load. Our concepts stand out by minimizing CO2 emission and primary energy saving. 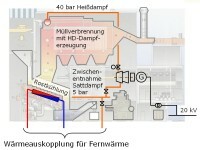 Due to the equalized load profile, such combined heat, cooling and power (CHCP) facilities achieve significantly more full-load-hours per year than combined heat and power facilities with heat-driven operation mode only satisfying the temperature-dependent district heat demand of municipal areas. Those combined heat, cooling and power facilities are being realized with cooled gas motors as well as gas turbines. Though the load profile of industrial heat, cooling and power cogeneration may not be subjected to distinctive load variations throughout the year, such variations do exist throughout a day and may be compensated by use of thermal heat storages that are part of the hydraulic concept. Liberalisation of the power market has lead towards low power delivery costs which implies a decline for the economic situation of combined heat and power plants. In consequence of the new German "CHP-law" (KWK-Gesetz, April 1st, 2002) and the fifth step of the "ecological fiscal reform" (oekologische Steuerreform, January 1st, 2003) as well as recently increasing electricity tariffs the cost effectiveness of some existing and newly constructed CHP facilities can be displayed again. There do exist different ways of promoting current entry into the public mains supply or own consumption. The planning spectrum of Roegelein Ingenieure concerning facilities for energy conversion also includes industrial district cooling stations for (process) cooling with electrical compression refrigerators and performance-adapted water cooling towers in wet and hybrid implementation. With regard to the revisioned EU ordinance on materials depleting the ozone layer from June 13, 2000 uncertainties do exist concerning the choice of suitable refrigerants for modernisations of existing and constructing of new refrigerators. For new facilities the natural refrigerant ammonia has to be considered from an ecological point of view since it won't affect the ozone layer or support the greenhouse effect. Ammonia also displays excellent thermodynamical properties as a refrigerant due to its high specific working capacity. On the other hand ammonia is as well toxic as flammable and therefore requires high standards on systems and safety engineering. Cooling related facilites using more than 3.000 kg of ammonia require authorisation according to the German 4. Bundesimmissionsschutzverordnung (4. BImSchV). The synthetic refrigerant R 134a is a non-flammable, nontoxic and inexpensive safety refrigerant applied to an in increasing degree in cooling related applications. Though R 134a won't deplete the ozone layer, it does support the greenhouse effect. Hence R 134a is being publicly discussed. Nevertheless refrigerators using R 134a are consindered calculable investments due to the lack of feasible alternatives. Roegelein Ingenieure have planned a facility for all-season district cooling generation for an industrial enterprise using electrically powered compression refrigerators each equipped with cooling tower condensers and heating condensers. During the heating period the buildings' low temperature heating is being supplied by this combined cooling-/heat pump system.